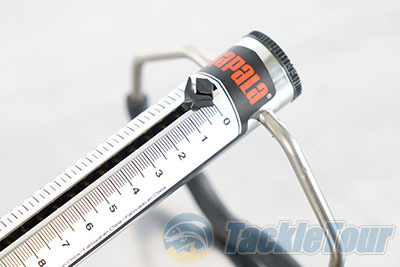 TackleTour Autopsy: How does the Rapala Tube Scale Measure Up? Introduction: Part of the fun of fishing is competing. Maybe it is a friendly competition between anglers, the pressure of a full blown tournament with money on the line, or simply just the quest to beat your personal best. While most anglers have gotten pretty good at estimating their catches, give or take a pound or two depending how honest you want to be, there is nothing like having a scale on the boat to silence your co-angling skeptics. While more and more anglers are moving towards digital scales due to their accuracy and ease of use they are also prone to their own challenges and limitations, including having to rely on batteries. 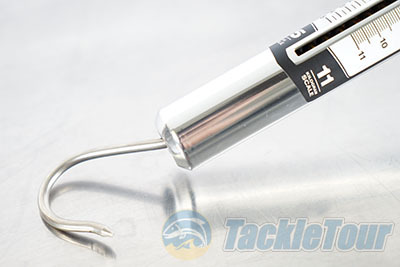 That is exactly where traditional handheld scales like the Rapala Tube Scale come in to play. These tube scales are great to carry on the boat as a reliable primary scale or backup measurement tool, one that will not ever run out of batteries. The additional benefit of carrying one of these scales is the ability to confirm that your digital scale is providing accurate measurements. Yes, we all have know that "one friend" that always challenges the weight of any scale, even if they see the readout with their own two eyes. It is in these occasions where I call the good old fashioned tube scale the "confirmer" or "argument ender." 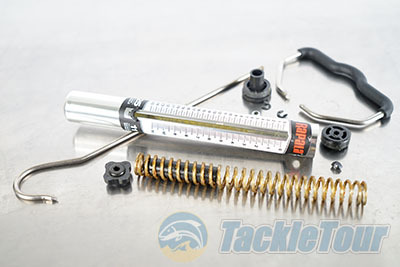 So just how reliable and accurate are these simple, and very affordable tube scales? We take a look at one of the top sellers in the category, the Rapala 25lb. model which typically retails for $16.99 at most e-tailers and retailers. The Rapala scale comes with a number of features that make it a popular choice among anglers on a budget. 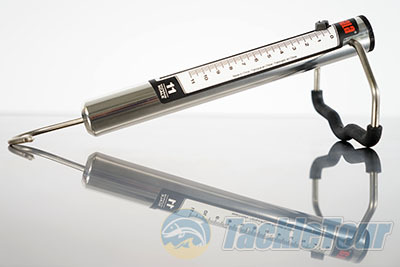 It may cost less than 20 dollars but features an aluminum tube construction, a non-slip rubber hand grip, a stainless steel hook, both pound and kilogram marks, and a marker slide to help provide more accurate max readouts. 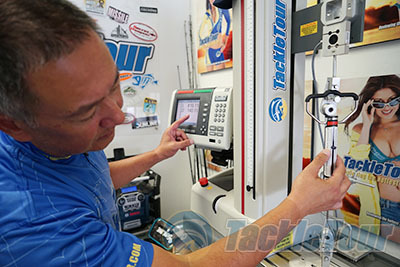 With the TT "Machine" in our lab which we use for measuring everything from reel drag pressure to line tensile strength we were able to test the scale's accuracy across the spectrum. Set for increments of five pounds we found the scale to be very accurate at the sub 10lb. measurements, and just a little less accurate beyond 15 pounds, but still within a half pound range, depending on you interpret the marker slide. 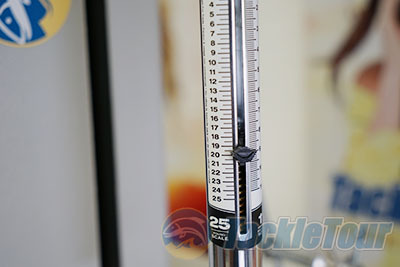 While most anglers probably are reading out the bottom of the marker, hence maximum weight, we found the most accurate measurement was the inner edge of the marker, right below the scale lever. At 20.1 lbs we checked the scale and the inner edge of the marker read right in between 20 and 20.5 lbs. Not bad for a simple spring loaded scale! 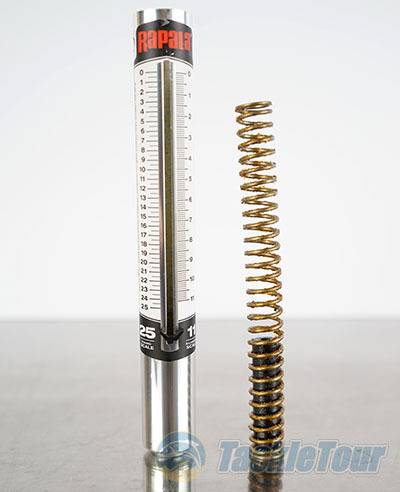 We compressed the spring multiple times and it still rebounded and provided the same measurement each and every time. Over seasons of use it is likely that the spring will start to loosen over time, but we expect under normal use it will provide accurate measurements day in and day out, especially if you are employing it primarily for fish that don't stress the scale to the max, like those big-mouthed green ones that so many of us spend our lives targeting. After we completed our round of measurement tests it was time to perform the autopsy. Unlike the lures that we usually sacrifice there was no cutting here. The Rapala tube scale features a simple design, something that we appreciate in a product like this as it helps minimize field failures. After removing the cap at the top of the sale we were able to access the single screw which holds the stainless steel hook that runs the entire length of the scale. After loosening this and removing the handle we were able to separate the hook and extract the heart of the scale, a long coil spring. The spring which is normally held in place with two plastic caps on either end of the tube is generously greased so that it slides easily under pressure when providing measurements, and as an added benefit this also helps reduce corrosion when subject to adverse field conditions. It is possible to service this scale and add more grease after a few seasons of use. Inside and at the bottom of the spring is a plastic tube which is used to align the hook down the center of the spring, once again a simple yet reliable implementation. 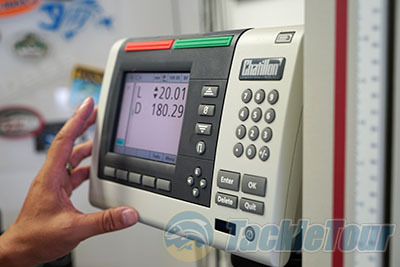 When we were done inspecting all the various elements of the scale we put it all back together and once again put it back on "The Machine" and was pleased to discover that it still provided the same measurements. Conclusion: While most anglers, myself included, now turn to digital scales for culling and logging their catches, it is always nice to have a backup scale option, and if you are not a tournament fishermen and simply want to confirm your estimations there is absolutely nothing wrong with employing a scale like the Rapala Tube Scale as your one and only weight measuring device. 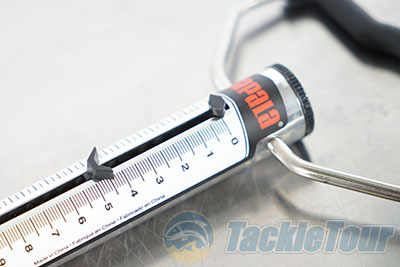 The Rapala Tube Scale (25lb. model) is cheap, but not cheaply made, and delivers measurements that are not just in the ballpark, but surprisingly "accurate." 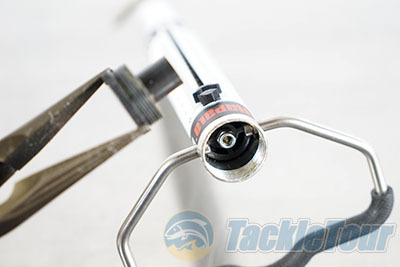 For under 20 dollars once we had the opportunity to break down the Rapala Tube Scale we can confidently say that it absolutely does measure up to the needs of everyday anglers.